I have two favorite movies which remind me of my love for Italy and its food. Do you know or have you seen Stealing Beauty and Mostly Martha? If not, this is something for you to do. But it started before I saw those two movies, a long long time ago. I am not Italian but I love Italian food. Does sound cliché? It probably does but such is my feeling about Italian food. Simple comme cela. My first holiday spent in Italy was a family holiday when I was 7, many years ago indeed. In the summer of 1976, the whole family packed the car full; my parents, brother, my cousin Daniel and I drove the 1000 + kms separating my home village in the North-East of France to the South, to spend a month on the East Italian coast. But not anywhere in Italy since our summer vacations were almost always spent by the seaside, au bord de la mer pour les enfants (by the seaside for the kids), as my parents would put it. They were indeed spoiling us in this way since they invariably took us to see the sea every summer (all right, we begged for it most of the time). So every year, I would explore and discover a bit more of the French West coast, the Mediterranean coast (which we then fiercely avoided due to people congestion as you see, French people like to flock together down South at exactly the same time in the year) and places overseas like Italy. When you grow up inland with no salty water body around you before miles away, you develop this strong thirst to see la mer, which becomes the dream place for young kids. Invariably during those vacations, our activities were as follows: daily visits to local vegetable markets in the morning to get ingredients for lunch, then lunch prepared by my mum, the obligatory afternoon nap (we hated this part so much) before going to the beach (our favorite part of course), cultural visits (mostly for my parents then), dinner, and playing cards. Every day, we would play pétanque before dinner with my parents and neighbours. The adults – as we called them then – also drank l’apéritif. So our Italian routine during that summer month was simple and we loved it. Would you be surprised if I told you that what I remember very well is the food and Italian pasta? Even if we ate at the restaurant every day, there was not one single day when the pasta looked the same. From the appetizer, to lunch or dinner, the pasta dishes were all unique and always came under another shape. I was still a young kid then but the impression left on me was huge. Italian food was superb I thought, and I remember it like this. Today, since I cannot go to Italy as often as I wish, I keep the country close by cooking its food. My range of Italian cooking goes from meats such as Osso Bucco to pasta such as fresh ravioli to name of few dishes, but there is one dish in Italian food that I love even more. Maybe because I am a lover of rustic foods, those very ones that not only nourish you with real nutrients and vitamins, but with stories. I know, I am a dreamer, but I cannot help it. Food has this power on me. So when I eat a minestrone soup, I imagine I could be one of the characters around the large country table in Tuscany as shown in Stealing Beauty. And since I have a lot of imagination, it really works magically. I am sure that I do not need to describe a Minestrone soup to you. In short, the name comes from the Italian Minestra, which very often describes a soup of medium thickness, with meat or vegetables. 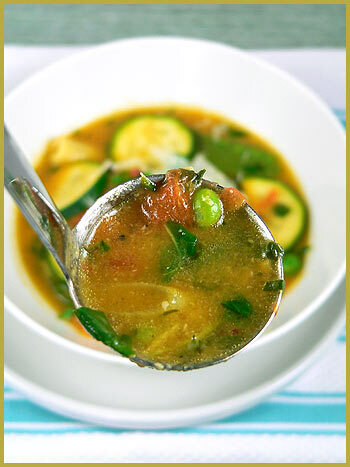 Minestrina means “little soup” whereas Minestrone means “big soup“. The latter usually contains pasta, beans and peas, topped with parmesan cheese. Because of its richness, it is usually considered a meal in itself. 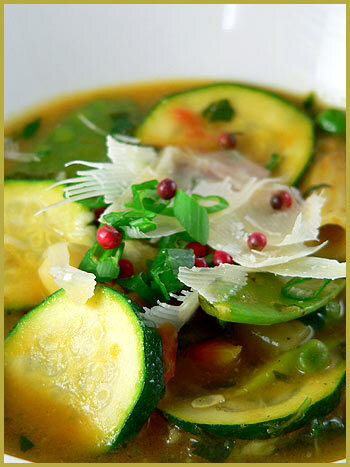 In Genoa, minestrone is served with pesto stirred in the soup. Eaten warm or cold is an option left to you, depending on the weather and your mood. Give me pasta, pesto, and vegetables and I call this the perfect light yet plentiful lunch. Just like the ones I love to have. Take a mortar and in it, place the peeled garlic cloves with the sea salt and pink peppercorn seeds. Crush together. Add the basil leaves (keep some for the end) and crush again. Then add the parmesan cut with vegetable peeler. Crush until you have a nice paste and slowly add the olive oil. Blanch your tomatoes in a pot with boiling water for 30s. Take the tomatoes out and cool them in iced water before peeling them. Remove the seeds and cut in small cubes. Keep the white part of the spring onions and slice it. Wash all other vegetables, and drain them. Slice the zucchinis very thinly. When boiling, add the rigatoni. If the pasta needs 10 mns cooking, cook them for 7 mns in broth. Then add all other vegetables and cook for 3 or 4 more mns. You want to keep the vegetables crispy. Away from heat, add the pesto. Add extra parmesan shaves and basil leaves. Season with salt and pepper according to taste, and serve warm or cold. Dans un mortier, mettez les gousses d’aïl pelées et dégermées avec le sel et les baies roses. Écrasez l’ensemble, puis ajoutez le basilic (réservez quelques feuilles). Continuez à réduire en purée. Ajoutez le parmesan coupé en copeaux (avec un couteau économe). Mélangez pour obtenir une pâte et puis ajoutez l’huile d’olive. Plongez les tomates dans de l’eau bouillante pendant 30s. Rinsez-les dans de l’eau glacée avant de les peler. Enlevez les pépins et coupez les tomates en petits cubes. Gardez la partie blanche des oignons et émincez-les. Lavez tous les autres légumes et mettez-les de côté. Coupez les courgettes en tranches fines. Faites chauffer votre bouillon de légumes. Lorsqu’il a atteint ébullition, ajoutez les rigatoni. Si le temps de cuisson de vos pâtes est de 10 mns, cuisez les pâtes pendant 7 mns dans le bouillon. Ajoutez tous les autres légumes et continuez la cuisson pendant 3 ou 4 mns, en gardant les légumes croquants. Hors du feu, ajoutez le pesto. Ajoutez des copeaux de parmesan supplémentaires avec des feuilles de basilic ciselées. Rectifiez l’assaisonnement selon votre goût et servez, chaud ou froid. Bea – that looks so good I can almost taste it! Your minestrone looks better than any I’ve had in a restaurant. You really are a pro. Note: I must get some pink peppercorns – they always look great in your shots! Lovely! Your photos are just beautiful. I could say lots and lots of compliments but I’ll focus on your beautiful first shot. Very dynamic and enticing! I love the colors! It’s lunchtime and I’m hungry. That stuff looks divine! Now, how did you get that ladle suspended over the bowl for the first picture? It’s such a creative shot! I was laughing as I was reading about the story of your vacations. I didn’t think there’d be so much similarity between French and Russian parents, but that’s exactly how we spent every single one of our vacations until we came to US. Even the routine was the same all the way down to nap and playing cards 😉 The only difference was that we didn’t have restaurants and my Mom cooked all our meals. Thank you so much for bringing up all those childhood memories. absolument pas l’heure ici pour manger une soupe mais en regardant les photos j’ai très envie de goûter à ton bouillon (il a l’air somptueux). It seems the minestrone of my mother that I have always hated… but goodness knows why seen here on yours blog it appeals to me more! C’est magnifique. Avec d’aussi belle photos tout le monde doit avoir envie de manger de la soupe. La recette semble délicieuse. my parents did the same with my brother and I. Another annoying thing my parents insisted upon was that we had to wait an hour after lunch before we were allowed back in the water, as they said that with too much food inside us there was a danger of drowning.!! Bea ou “comment photographier un bol de soupe”. Superbe, et genereux comme toujours. Jolis souvenirs e vacances en tout cas. what a lovely post and your photos are wonderful! What beautiful memories from your childhood. And I especially find them so beautiful because they are so much like what I remember. Many times as children and teenagers we got to go to Italy for the summer. Part of the time we would be in the small little town in the mountains where my father was born. The town was mostly empty but there were all these wonderful old homes with vines growing over them. It was like going back in history. And the other part of the time we would be at the sea. 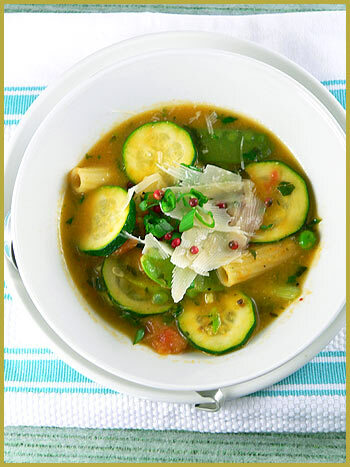 Like you, minestrone is one of my favourites. My mother’s is my favourite especially when she makes it in the summer with all the vegetables straight from her garden (giardino!). And finally … I love “Mostly Martha”. Love it! I keep meaning to buy the DVD. I have not seen “Stealing Beauty” but have heard many people say that it’s very good. This post is a great way to start the day. Merci! Ce qu’elle est belle ta soupe ! on a vraiment envie de la déguster ! I realized today I’d never linked to your BLOG. Now people will think I’m culinarily cultured! I also see you’re a fellow WordPress user. I like the photos sidebar. Is it a plug-in, or do you have a PHP recipe? 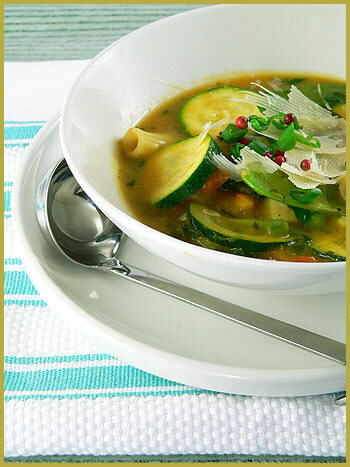 Looks like the best Minestrone soup I’ve seen! I LOVE Mostly Martha- great movie! Ouiiii !! Je viens de me rendre compte qu’en plus de la VO il y a maintenant une version “sous-titrée français” ! C’était presque un supplice de venir se délecter des titres et des photos sans pouvoir comprendre les secrets de ton savoir-faire… Mille mercis ! Pffff, encore une photo pipotée c’est sûr ! Me donner envie de soupe chaude quand il a fait 28 degrés aujourd’hui, it can’t be for real ! 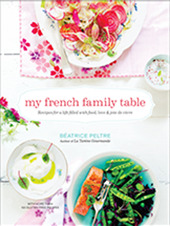 Next week I’ll send to you the sorbet recipe..
Quelles photos. Et quelle recette, il faut bien le dire. Thanks Carol, very sweet of you! Catherine, yes definitely get the pink peppercorns. They are a great touch! Anita, thank you! I had fun taking it! Eggy, not sure when the web will enable us to share food for real! Would be cool! Helen, ah yes very funny indeed about your parents. SOme things have no boundaries and are really common to all! ANd I just held the spoon in front of the camera! Gastrochick, YES. Our parents had the same rule, no siwmming before a few hours after lunch and we hated that even more!We kept begging them time was up and we could go! Gracianne, merci, c’est bien gentil ton mot! Kat thanks and welcome back! Hope your trip was good! Ivonne, I wish I could taste your mum’s minestrone! ANd yes those movies are great to have . I actually own a copy of Stealing Beauty since I liked it so much. Doug, nite to read your note. It is not a plug-in, but just a feature of WordPress. Hope you are well, it has been a while! Merci Christine, ravie de savoir que ca te plait! Orchidea, thanks a lot for stopping by! I am glad you are enjoying it! Sandra, super, thank you! 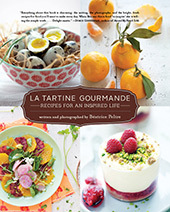 I cannot wait to get the sorbet recipe! Tarzile, coucou voisine! Ravie de savoir que ca te plait! J, yes indeed. It was even summer here today with temp of 85F! Unreal!